My Bag for All Seasons is done!!! Parts of it have been seen before on the blog. The feature fabric in the centre is “freestyle rosepath”, blogged here. 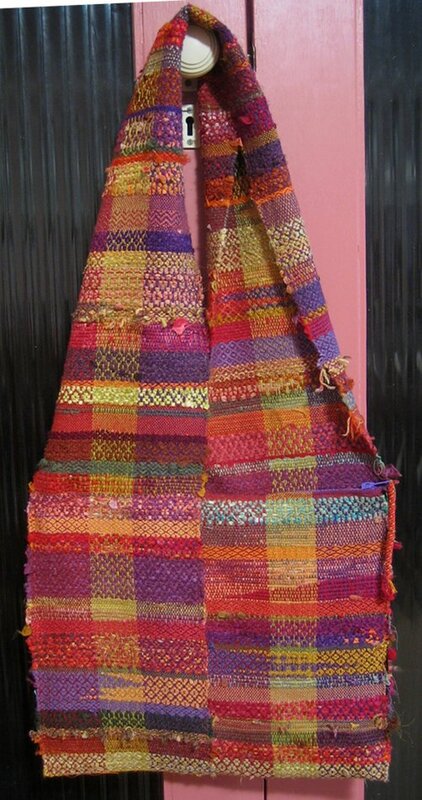 It was initially intended as a very simple bag, similar to one I’ve done before (here). There was a certain amount of languishing and distraction, then I decided to use it in a class. This meant more fabric was required and it was a fun and fast (for me) weave – read its story here. 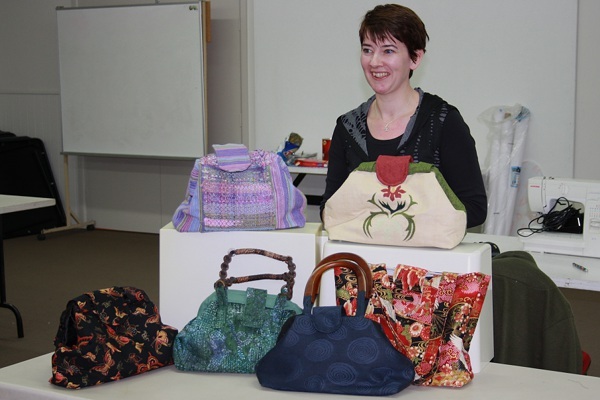 The bag class with Helen MacRitchie was a very pleasant weekend. I posted about it here, and you can see some of Helen’s lovely work such as her award-winning bag pictured here and at the moment some in her etsy shop (including one with nunofelted silk georgette in a spiral fabric which I rather covet…). At this point the bag could pose with others from the class and looked fairly complete – except for the vital detail of handles, plus how was I going to attach the tab closure artfully balanced for the photo shoot? The photo on the right shows some of the sampling done to answer those questions. None of the commercial handles available worked with the bag so I decided to try braiding some, using the same cottolin that was the warp for both the fabrics used. The first attempt was the flat braid on the left, but it was too flimsy and stretchy. I decided to try a round braid with a commercial cord at the core to provide some extra strength. This photo shows the setup. I used the warping wheel to wind the warps for the braid, and it also provided a very convenient way to hold the core cord while I was braiding. I wanted mixed colours – version one was too green, but I was happy with version two. (An aside – my original improvised tama seen here used plastic embroidery thread bobbins attached to metal washers. They weren’t really comfortable in the hand, so now I’m trying some door stops with more metal washers inside. A definite improvement). The next issue was how to attach the braid handle to the bag. First idea was some kind of tab on the bag creating a channel – the braid goes through and is finished with a knot and tassel. Lots of problems with that. On my bookshelf I found a copy of Stuart Gainger’s Creative ropecraft. 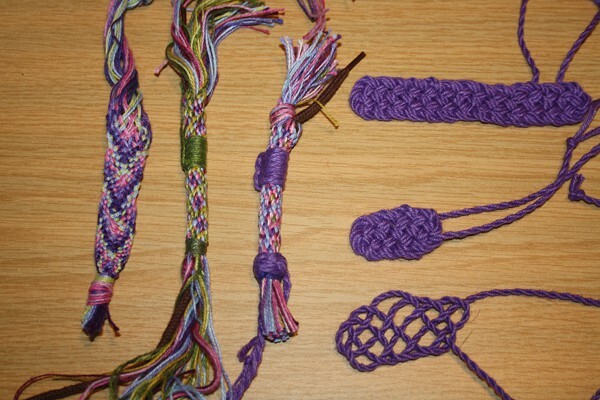 In the photo above of samples you might be able to see the Turk’s Head knots on the practice braids. 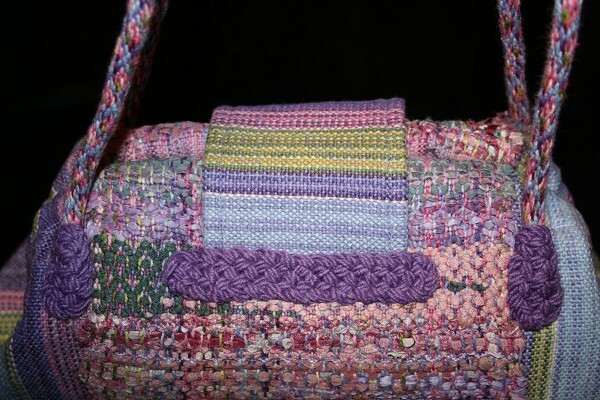 The idea was to sew the braid directly to the bag, working around the knots which would hide the join. I actually started on the bag doing this, but it was harder to do than I expected plus I worried that the weight of the bag on the small sewn area would tear out. On the right of the sample photo is the final idea – a Prolong Knot, which Mr Grainger informs us is “a method of extending a flat three lead four bight Turk’s Head into a rectangular form”. The “rope” used is three strands of cottolin, twisted together very tightly (using an electric drill with a cuphook instead of a drillbit to hold the threads) then folded in half to form a two ply cord. At the bottom right of the photo is the knot, still loose. Above that is the same knot, with the lead doubled and everything tightened up. I have to admit it took me quite a few attempts to get the hang of this. It was only when I used my “weaver’s eye” to follow the developing interlacement that I got it. At the top of the photo is a version that has been extended by a lengthening/repeating process, which was no trouble at all (really – no sarcasm. By then I knew it followed our familiar over-under). Here is a closeup of the result. I sewed on the braid, over a wider area than was possible with the earlier attempt. I used a tacky glue to attach the knots, reinforced by sewing around the edges (using more of the cottolin plus thread heaven). I’m hoping the combination of all this will distribute weight in use well enough. As you can see the knots also solved my closure attachment problem. I just kept extending the knot until it was long enough, then used the sew-on/glue-on/sew-on technique. At one point I was going to wind some more cottolin cord over the central areas of the handles, as extra reinforcement where it will be held and to camouflage dirty/sweaty handmarks. But it didn’t look good, to be honest I’m a bit over the whole thing, and I can always add it later if necessary. Here’s a final shot of the inside of the bag. Have I mentioned the attention to detail of Helen’s bags? Fully lined of course. A couple of pockets, zippered, open, and nice&tight for a pen. A neat casing to hold a snap-open frame. The tab and magnetic catch closure. And you can’t really see it, but a firm bottom supported by cute little feet. This has always been intended as a gift – fortunately to someone close so I feel comfortable saying “it’s my first – give it back for me to fix if something doesn’t work out”. I’m already thinking of a few changes for mine – but there’s quite a queue of things beforehand. Helen is an excellent teacher. She provided us with clear notes including lots of photos, so we could focus on watching her demonstrations and just jot down a few extra personal reminders. Helen makes very well engineered bags. 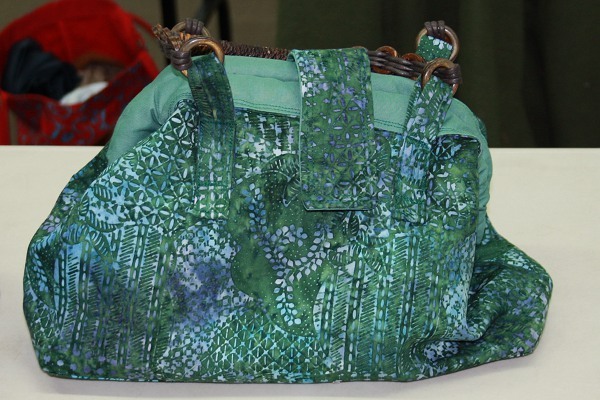 We used a a range of interfacings, wadding, various bits of handbag hardware and a wide variety of fabrics. More important were all the techniques and options that Helen taught – for example at least five different methods to make pockets and a huge number of those small details which make all the difference in a final product that is beautiful, functional and hard wearing. With 2 days of focused work most people finished their bags. We all used Helen’s basic pattern but there was lots of variety in the results – with and without a frame, additional depth, the fabrics of course and all the details of handles, closures etc. I was busy and only took a couple of photos. 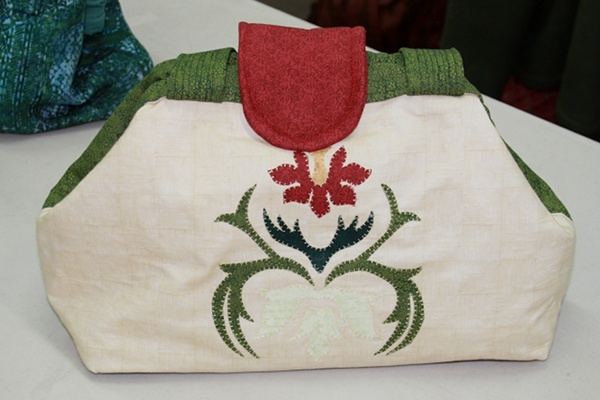 Kathy used some lovely handwork on her bag front. A friend recently asked for some info on the “freestyle rosepath” I’ve done. (Hi Fliss!) 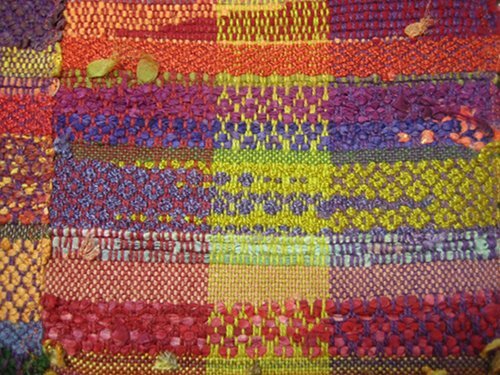 Which has spurred me on to document some weaving I actually finished back in the summer holidays. This is intended to become a bag, a gift for someone who suggested “hydrangeas” as a colour reference. I missed Christmas (oops), then thought that maybe the simple shoulder bag style might not work well for the recipient. So the length is still waiting patiently for plan whatever-letter-I’m-up-to (subject of the next post, maybe). Threading: What I know as “Rosepath”, though there may be other names (or other things with the same name!). This snapshot from fiberworks PCW shows the draft. I think a floating selvedge helps. Warp: 2/22 cottolin (60% cotton, 40% linen), sett 18 ends per inch. In other projects I’ve used stripes, but this time I wanted to suggest light and shadow flickering in a spring garden so I did a lot of swapping colours in and out. Weft: This time I used a tabby (that is, a plain weave pick between every pattern pick), a very fine cotton, with the idea of increasing durability slightly. Most other times I’ve done this I haven’t bothered. The bag I made in November 2009 has been used almost daily and while it needs a wash and a few repairs it hasn’t done badly. 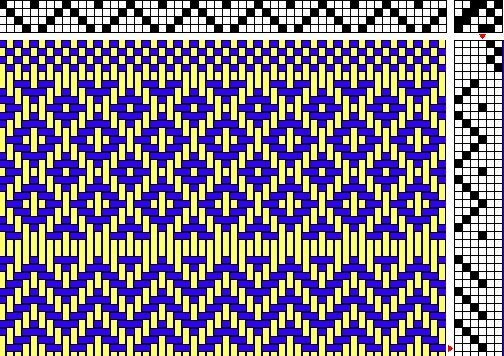 Pattern weft: This is where you can go to town. I gather a pile of “stuff” that fits the colour scheme, then pick and choose as the whim takes me. There are yarns – some silk (fancy spun, a thin ribbon yarn, a boucle…), wools, maybe cottolin. If they are fine I tend to wind a few yarns together (I use a stick shuttle for this) so the pattern isn’t too small. Thrums (leftover warp) from other projects are good. 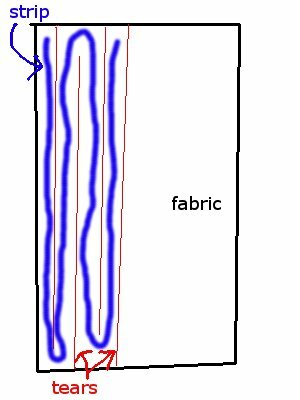 I also tear fabric into strips and use that. I like the raw and shaggy look, but I suppose you could cut on the bias if you want. I also deliberately play with which side is showing to get colour variation and texture – for example in the red/pink/white mass about third section down in the photo on the right. The fabric is mostly silk, plus some cotton and probably a couple of synthetics. I have various bits and pieces from old dye experiments, plus bits of old kimonos etc. It just needs to be pliable enough to sit happily. I’ve used habutai, tissue and organza silks. I deliberately tear stripes of different lengths and widths, to keep up the randomisation factor. I also try to repeat things a few times as I’m weaving – you can only see a few centimetres of recent weaving, so I tend to have two piles. I select a piece of cloth from one, tear a strip, throw the remainder into the second pile. When I’ve finished the first pile I start with the second and repeat the process. Or cheat and pick something that catches my fancy out of whichever pile. To make the strip I use scissors to nick the edge of the fabric and tear almost to the other side. Then I cut a nick on that side and tear back. This gives you a longer strip of fabric weft, with little extra tags of fabric at each turnaround point (which I quite like as extra texture). Lift plan: I’ve shown the few simple ones that I use in the draft above. Mostly the “as drawn in” bit, but not entirely. 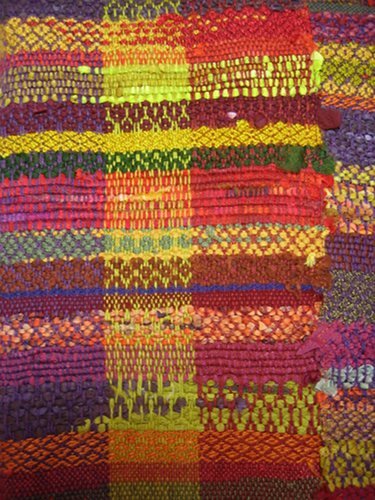 The other major technique I use is clasped weft. Kaz has a brilliant tutorial here. A couple more photos you can click on for details if you like. None of this is new or original to me. Among lots of influences two blogs stand out – Susan at Avalanche Looms and Terri at Saori Salt Spring. 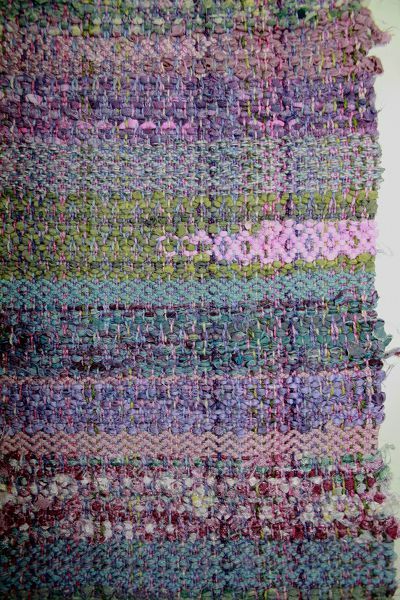 The recent flurry of posts is nearing an end, as I approach my self-imposed deadline and also bring my weaving story right up to date. This was on the loom a couple of weeks ago, and reached its final form earlier today. The card fronts (blogged yesterday) were fun – I wanted more. 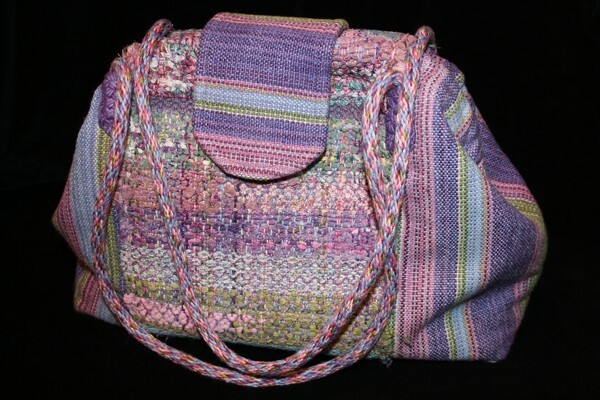 This bag is the same idea of cottolin warp threaded in rosepath, all sorts of yarns and torn silks as weft. 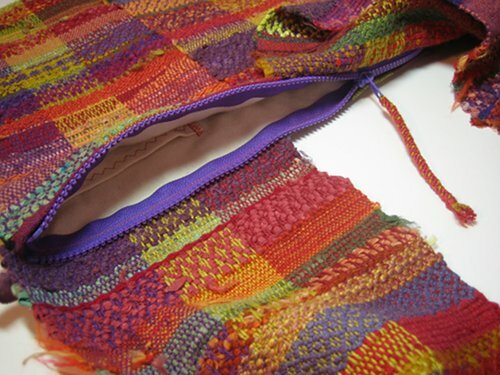 I deliberately left loose ends and created even more by tying small bits and pieces together, to get lots of texture. 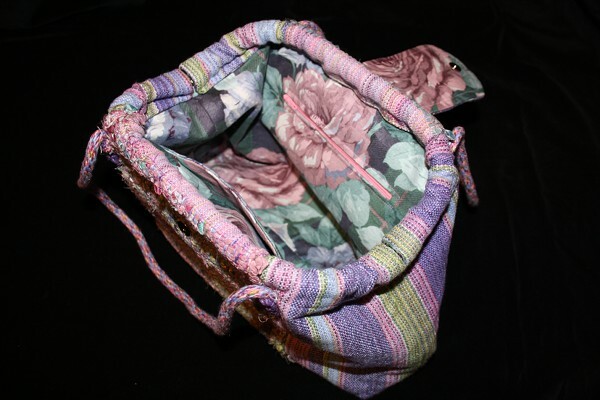 I used the fabric to make a bag in the Doni’s Delis style. I decided to go all the way with lining, pockets and zip closure (complete with pull tag of some of the weft yarn, knotted with crown sinnets using instructions from 200 braids to twist, knot, loop or weave by Jacqui Carey. I really like this book – great photos, lots of options and clear instructions). I also tacked together the selvedges in the part that goes over the shoulder, to help the bag sit nicely (the cloth is a bit stiff to drape or bunch well). One of the things I like about “allsorts” wefts is the changes in scale using the same liftplan. 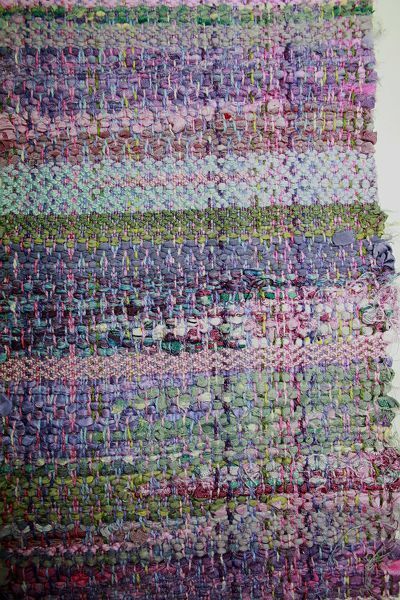 Another favourite is using clasped weft with the rosepath lift. You can get a really interesting broken line effect. 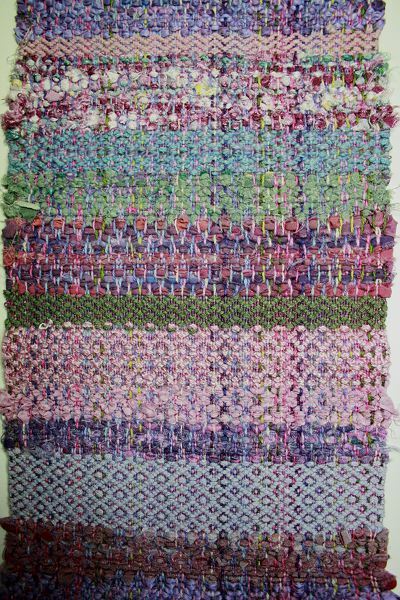 I tried to use every weft at least 2 or 3 times and also kept to just plain weave and a single rosepath pattern, to get some coherence over the fabric as a whole. However I did try to keep varying the combinations. The colour theme was “autumn” – although for me that encompasses a lot! I couldn’t capture the richness of the colours in these photos. I guess that’s not its proper name, but then it’s not about “proper” weaving. Influenced by what I’ve read about Saori weaving, but on a rosepath threading and a mixture of plain weave and rosepath during weaving, some clasped weft in both. 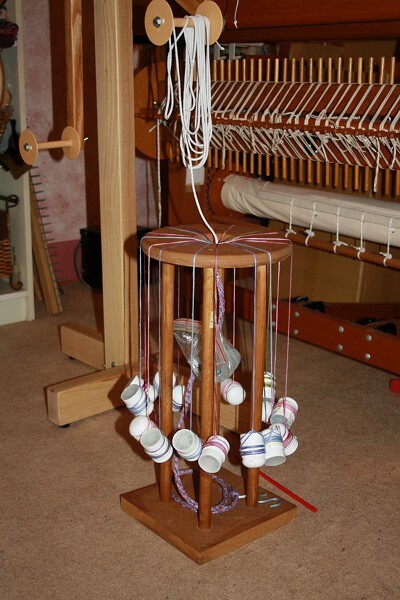 Warp cottolin, weft all sorts – a lot of it silk I’ve dyed in the past both yarns and fabrics torn into strips, plus thrums, some tied together with tufts waving. Intended to become a bag à la Doni’s Delis. 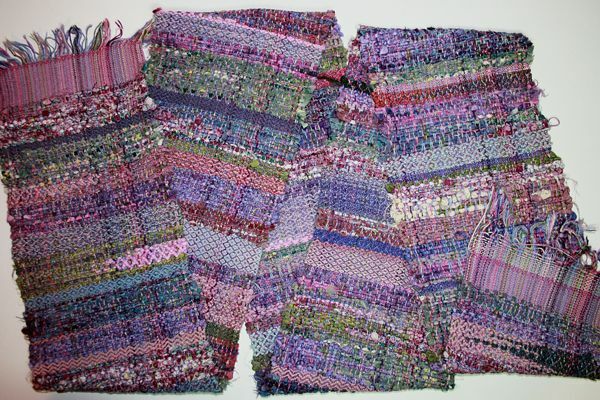 A great project to get back into weaving after a long dry spell with neither time nor headspace for creative pursuits.